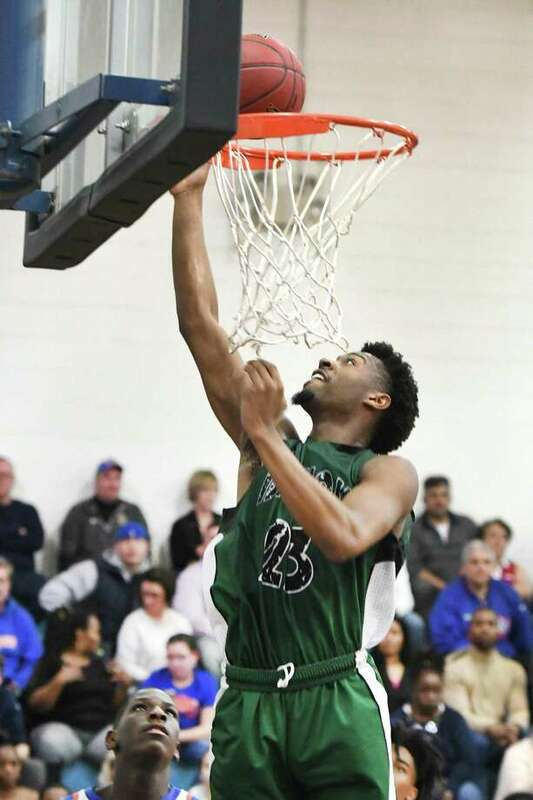 Bassick’s Jordan Gallimore makes a basket during a game against Danbury earlier this season. Storyline: So now the streak stands at 105 consecutive wins in the Naugatuck Valley League for Sacred Heart. When you go that many years — the Hearts haven’t lost since the 2014 final to Crosby — you sometimes need to find ways to get motivated. So when guard Nate Tabor was left off the all-league team (he missed five games due to suspension) — the players who did get selected chose not take part in the league photos, a sign of unity. So what’s the motivation for the Division I state tournament? It’s simple: they lost in last year’s final. When you have a great program, losses are not tolerable. You should know: Sacred Heart won four consecutive state championships before losing to Notre Dame-Fairfield in last year’s Division I final. Storyline: East Catholic made a great comeback from down 23 points in the third quarter on Thursday night, but fell short of winning its fourth straight CCC tournament title. It was an amazing comeback, but it was also a shock Windsor was able to take it to East Catholic like that in the first half. The Eagles desperately want to be the last team left standing in Division I, behind Joey Reilly, Matt Knowling and Jaylin Hunter, the transfer from Nebraska. You should know: East Catholic’s last state championship came in 2016 in Class L.
Storyline: Bassick doesn’t have a league championship, but as an independent, arguably did have the toughest regular-season schedule with games against East Catholic, Weaver, Danbury, Ridgefield, East Hartford and Hamden among others. Head coach Bernie Lofton has been with the program a long time as an assistant before taking over for Harrison Taylor. He would love to gain his first state title in two weeks at the Mohegan Sun. You should know: Thirty years ago, Bassick finished undefeated after winning the Class L state championship against Harding in double overtime. Storyline: Windsor has had another great season behind guards Corey McKeithan and Amir Spears, losing only to East Catholic and a pair out out-of-state teams. Windsor took apart East Catholic in the first half of the CCC tournament final, then had to hold on for dear life in the second half to win. Can this group of Warriors make a run in Division !? Another group of Warriors — Wamogo — are the top seed in Division III. Wamogo owned the Berkshire League once again and now would love to go deep in the state tournament like it did in reaching the Division V final last season. You should know: Wamogo is 0-3 in previous trips to the state finals. Storyline: Notre Dame-West Haven was the best team during the regular season in the Southern Connecticut Conference, losing just one game in overtime. Behind Connor Raines and Zach Laput, the Green Knights have been in the top 10 all season long. But Notre Dame is coming off a loss to Cross in the SCC tournament final. Now Notre Dame could face either Cross or Hillhouse for a fourth time on Wednesday. Can the Green Knights recover? You should know: The last time Notre Dame reached a state final was in Class LL in 2003. Storyline: Wilbur Cross was having a so-so regular season, but then handed Notre Dame-West Haven its only loss in game No. 2 in overtime. Then the Governors stepped up their play even more, beating Cheshire, Amity and Notre Dame in succession to win their seventh SCC tournament title, the first since 2008. Now can Cross continue this run in Division I? It hosts Hillhouse on Monday, with Notre Dame awaiting the winner. You should know: The last time Cross reached a CIAC state final was in Class L in 2003. Storyline: Waterford was the headliner in the ECC, repeating as the Division I champion, but St. Bernard was also impressive, earning a three-peat in Division 2 by beating Stonington in the final. Behind De’Andre Williams and Max Lee, the Saints will be tough to stop on offense as long as they remain alive. St. Bernard is the No. 5 seed in Division IV and hosts Masuk in the opening round. You should know: St. Bernard is seeking its first state championship since 1982. Storyline: It’s been a decade since New Canaan has qualified for the CIAC state tournament and quite more time since the Rams were even considered to be a state title contender. But after an impressive regular season in the FCIAC, New Canaan enters Division IV as the No. 4 seed and gets a bye into the second round, hosting the winner of Griswold and Platt on Wednesday. You should know: It’s been 30 years since the Rams last played in a state final, losing to FCIAC mate Danbury in the 1989 Class LL title game. Storyline: Cromwell remains one of just two undefeated teams this season. The Panthers hold the state’s longest winning streak at 27 games, which includes the Shoreline championship, beating Old Lyme in the final in overtime. Behind Gabe Charleston and JJ Tracy-Garvin, Cromwell now tries to win back-to-back state championships, this time as the top seed in Division IV. You should know: Cromwell has nine state championships to its credit. Storyline: Innovation has completely flown under the radar this season, compiling an 18-2 regular-season record to be the top seed in Division I. Then Innovation won the CRAL tournament. Now the squad will be the top seed in the Division V state tournament. Can this unknown from New Britain reach the Land of the Sun? You should know: Innovation’s two losses Have come against Manchester and Suffield.